On Friday I had an outing to Pride and Provenance, which is situated in Halifax Town Centre. It is just outside the Piece Hall, opposite the entrance to Square Chapel. They always have a chalkboard outside the door with a funny or motivational quote on for that day! The décor is very warm and modern and a great place to go for a lovely lunch or cheese and wine eve with your friends on a Friday/Saturday evening. You can even go in to buy their cheeses and wine to take home with you. I have to say the service here was outstanding! We were served by Chris and Jude who made you feel extremely welcome as soon as you arrived, and always made sure we were ok for drinks and that everything was great with the food. Chris could tell you anything you wanted to know about the produce they were serving. He knew where all the foods had come from and fun facts about certain ones, he even recommended some great things off the menu. To start with we had to try their Raclette cheese, which was melted on to sourdough bread and served with gherkins. It smelt amazing as they heated it up and scraped it off the cheese wheel onto the bread. It made my mouth drool just watching him make it. It was like a posh take on cheese and toast and a great way to start the cheese filled evening. 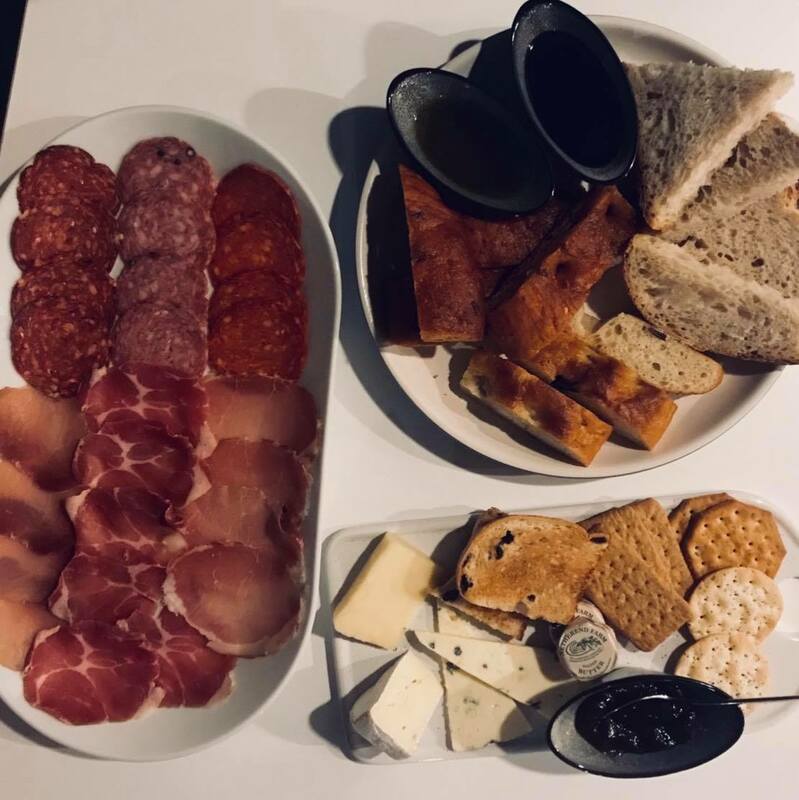 We decided we wanted to try a little of everything, starting with a cheese board. You can either pick 3 or 5 cheeses from their selection and they even had a few on the specials board. As soon as I saw the specials, I knew we had to try the truffled brie and Chris even said that this was the best choice, he wasn’t wrong! A super smooth, rich brie with a beautiful touch of truffle! We also tried their whiskey cheddar and the Duke of Wellington Blue. It was quite a subtle blue, but lovely and creamy and amazing with the chutney. When they served the food, they also explained everything we had, and we were told that the Duke of Wellington Blue was made in France and only ever meant for the royals, but they had now decided to serve it to the public – it was outstanding. Apart from the Duke of Wellington Blue, their produce is all locally sourced and many of the cheeses can’t just be bought in the local supermarket. So, they really are something special and a perfect treat to have on a weekend. The cheese board was also served with a selection of crackers, fruit loaf and chutney. With the cheese board we opted to get a selection of meats too. They sell their meats singular or you can pay for a selection of them all on one plate. We couldn’t decide which one to get, so asked what they recommended, and they ended up giving us a selection of them all anyways. Which I could not complain about as I got to try cuts of meat I had never had before and even found some new favourites. The meat board was also served with the largest selection of bread, olive oil and balsamic. The bread we got was a selection of sourdough, sun dried tomato focaccia and rosemary focaccia. The bread is super local as it is made in the newly opened Trading Rooms, in the Piece Hall and also from Love Bread, in Brighouse. The best was their Rosemary focaccia dipped in the olive oil and balsamic. The balsamic was slightly sweet and complimented the bread, meat and cheese amazingly. The selection of meats was fabulous! We got Yorkshire Coppa which is from the collar of the pig and now a new favourite of mine. It just melted in the mouth! As well as, Prosciutto, Chorizo, Yorkshire Lomo, Salami, and easily the best one Pork and Fennel Salami. This was packed full of flavour, cut into lovely thick slices. We washed this down with a lovely gin and tonic. I had the Whitley Neil’s rhubarb and ginger with a slimline tonic, which was perfect. Pride and Provenance is also a great place to go for breakfast, as they serve a lovely selection of bagels and fresh pastries or even for just a coffee and a slice of cake. They get their cakes from G’s Cakes in the Piece Hall, which is another favourite of mine, so make sure to head to Pride and Provenance to try out some delicious cakes, cheese, wine and more! I hope you enjoyed another review and let me know your opinions of Pride and Provenance or any other places you think I should visit, in the comments below!